These days, when people need ‘something’ they ask the internet. So if your online presence isn’t up to scratch - you’re not even going to be considered. A good website will not only look awesome, it’ll build credibility and turn your visitors into customers. In today’s fiercely competitive market, your website is more than just a pretty face. If it’s done right, your website will do all the “heavy lifting” for your business... from capturing web visitors' attention, to delivering a delightful digital experience, to converting your potential prospects into loyal customers. Unfortunately, many small business owners in Los Angeles are leaving money on the table with cookie-cutter websites that fail to turn visitors into paying customers. Unlike other web design firms who only care about how pretty your page looks, we specialize in websites that convert. 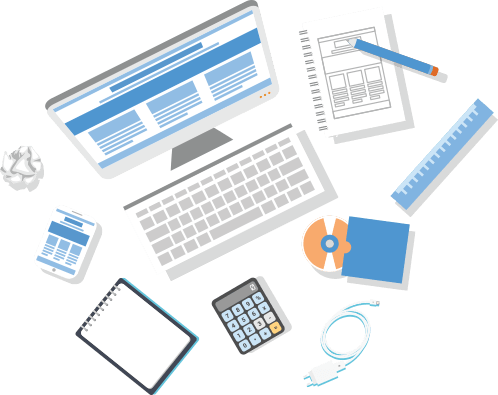 We view web design as both an art and a science, and we have the technical skills and marketing know-how to build you a custom website that gets visitors to put their money in your pockets. It doesn't matter if you need web design services for your ecommerce website or your local small business, our Los Angeles web design agency will pack pounds of muscle on your website and effortlessly transform it into a conversion machine! The first step is always about information gathering, identifying things like the website purpose, goals and target audience. The second step is planning. A plan includes a definition of the site map, structure and technologies that we're about to use. Not only do we focus on wireframe models and the visual styles in this stage but also usability of the user interface for the best possible user experience. A very important part of the process is choosing the right text, photos or videos. All optimized not only for visitors but for search engines. Here we actually create the website using the hypertext mark up language and cascading style sheets with some help from databases and other technologies as well. We test all the technical features like coded scripts, compatibility with major browser but we also ask ourselves if the website really fulfills it’s purpose. After we launch the site our job is definitely not done yet, we always monitor what’s happening after the start, enabling us to fix any possible deficiencies. With over 700 projects under our belt and 45 years combined experience we are committed to your success whether you're a start up business or a Fortune 500 company. If you’re after a super easy CMS system then fly with WordPress. It’ll make managing your website simple. WordPress is the most popular open source content management system on earth. It’s vastly adaptable, endlessly expandable and intuitive if you’re not so confident. We love Magento for e-commerce. You can tailor it EXACTLY to your needs and use the tools to save time. With Magento you can open your doors to a global audience and never have to worry about closing them. You will have full control over orders, customers and stock from an advanced but intuitive system. Drupal is a open source platform to power your website and applications. It’s flexible and scalable to suit any size audience and backed by an awesome global community that you can hook into. Joomla is right up there in CMS popularity. It’s easy to use and open to everyone. It's a sound alternative to WordPress. Especially if you need to power up any online applications.